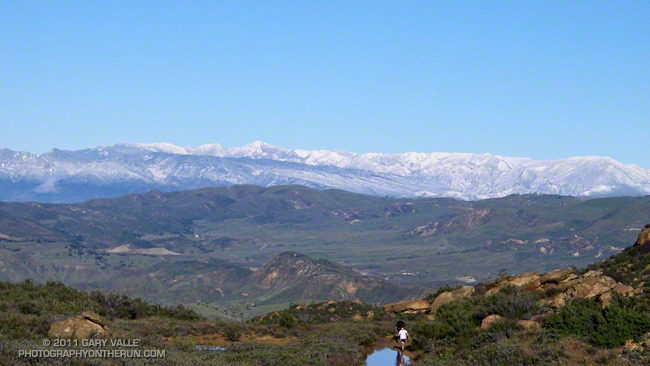 Cool temps, clearing skies, and snowy vistas greeted runners doing the 2011 edition of the Bandit trail races at Corriganville Park in Simi Valley, California. 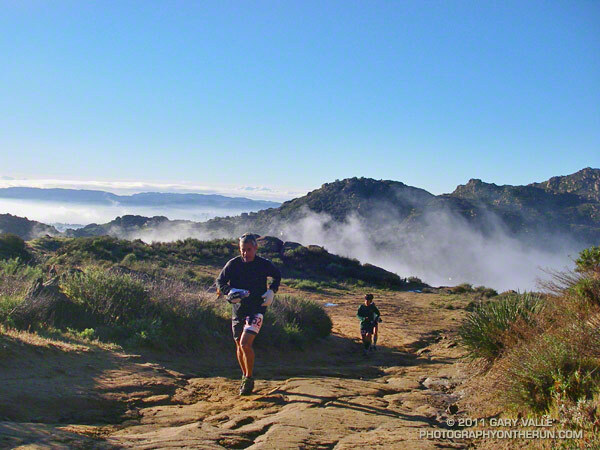 If you’re going to have a trail race after a rainstorm, Rocky Peak is the place to do it. Rain gauges in the area recorded as much as two inches of rain in the 48 hours leading up to the race, and for a while it looked like there might be a dusting of snow on the highest points of the course. Except for a couple of short muddy sections, and having to dodge a few mud puddles, the dirt roads and trails were in good shape. This year the race was expanded to include a 50K. 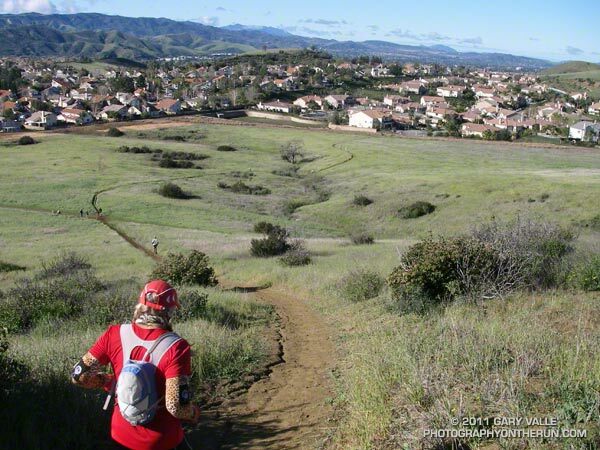 This new option doubled the fun on the Chumash-Las Llajas loop of the 30K course, running the loop twice, and also took a short sightseeing trip down to the Rocky Peak trailhead at Santa Susana Pass. The 30K course was the same as last year, but the 15K course was shortened from last year’s 16K or so to 15K. The 50K course is a tough one, including about 7 miles of technical single track trail, 22 miles of fire road, and a mile of paved road. The elevation gain/loss is about 5400′, which is a little more than the Bulldog 50K course, and a little less than the original Mt. Disappointment 50K course. 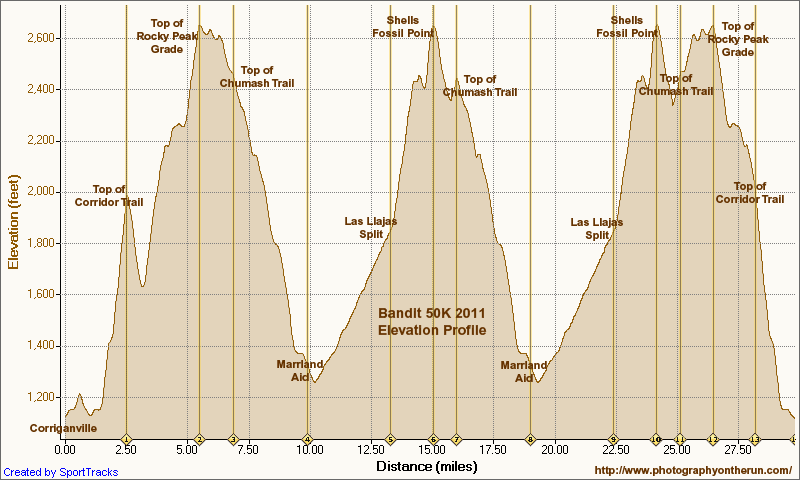 Here’s an elevation profile of the Bandit 50K course. There are several difficult stretches on the 50K course. Just a mile into the race runners have to deal with a very steep climb — an 800 foot ascent in just one mile. In my mind it’s the most important mile on the course, and how hard you push here can have a big effect on how you feel over the next 28 miles! There are a couple of other long climbs. The 2.3 mile climb from the Rocky Peak trailhead to the top of the Rocky Peak grade gains over 1000′, and the gain over the 1.75 miles from the Las Llajas split to the highpoint at Shells/Fossil Point is 800′. 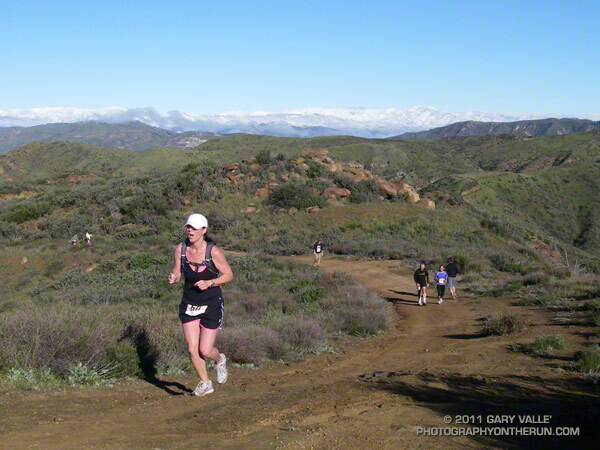 Runners doing the 50K get to do the Las Llajas to Shells climb twice. 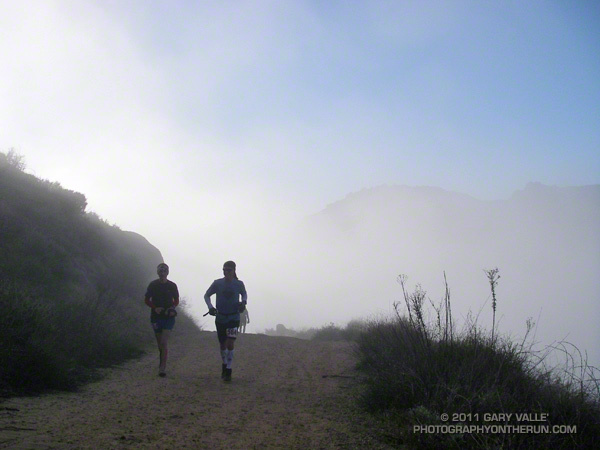 One of the toughest sections for me was the run up Las Llajas Canyon on the second Chumash-Las Llajas loop. This section starts at about mile 19 and ends at the Las Llajas split, where the road forks right and up through the oil fields. 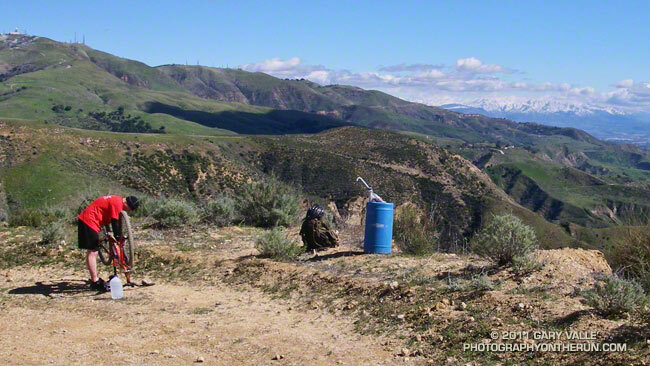 For the most part the grade is not steep, but the miles are deceptively long and grueling. 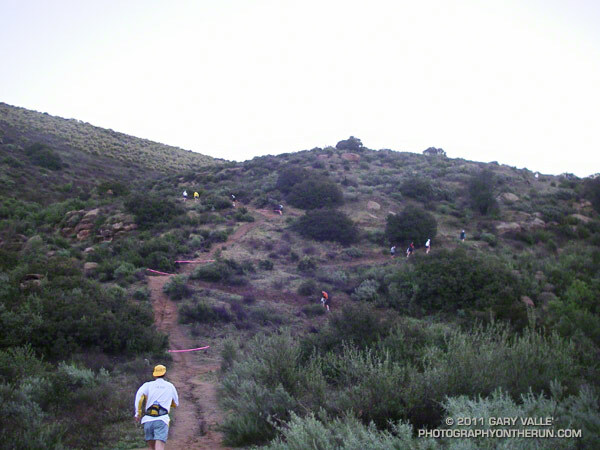 Also tough on tired legs is the very technical plunge back down to Corriganville at the end of the race. Congrats to 50K winners Chris Price and Nancy Ishizawa. Clearly enjoying the day, Chris flew through course in a remarkable time of 4:12:51, averaging 8:28 minute miles. In the 30K Marcelo Mejia set a new course record with a blazing time of 2:52:31. On a slightly shorter course than last year, Fernando Ramirez and Jen Todd put down fast 15K times. 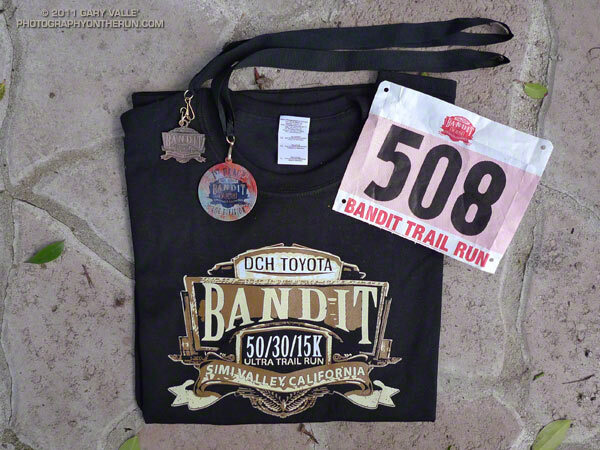 For all the results and race photos, see the Bandit web site. All in all it was fantastic day for a run! Many thanks to the race organizers — Randy & Sarita Shoemaker, Larry Lee, and Todd Baker — and all the volunteers and sponsors for an outstanding event!